With the silver mines in his possession, Hamilcar now had the means to fund further expansion into Iberia. Hamilcar was so successful that in 231 BC the Romans sent envoys to see what he was up to, but his explanation that he was after silver to help pay Rome their war indemnity was deemed acceptable. Later that year Hamilcar was joined by his second son Hasdrubal. In 230 BC Hamilcar captured the Castulo mines, reputed to be the richest silver mines in Iberia, from the Oretani tribe. 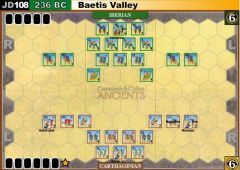 In early 229 BC Hamilcar began to capture various Oretani fortified settlements between himself and Gades on the coast, in order to secure his lines of communication. In the summer he placed the town of Helike under siege, but had still not captured it as winter approached. Unwilling to lift the siege, Hamilcar sent his elephants, heavy infantry and much of his cavalry back to the coast. The Oretani King Orisson. 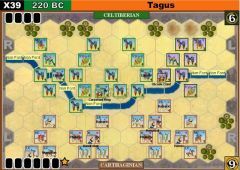 learning of the weakening of the Carthaginian army at Helike, set out to engage them. Hamilcar lifted the siege and tried to withdraw, but his army was caught by the Oretani and forced to give battle. The battle began with an attack by flaming Oretani oxen driven wagons. 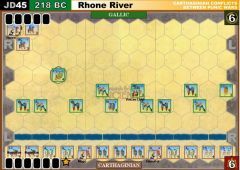 These caused chaos in the Carthaginian lines which were then assaulted by the enemy infantry. 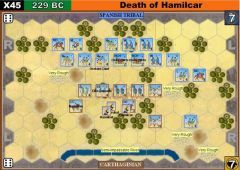 Hamilcar desperately held the line until his sons made their escape. He then retreated with his remaining troops but was drowned when he tried to cross the swollen Tader River. The conquest of Iberia would continue under the command of Hasdrubal the Slendid, and on his death in 221 BC, by Hannibal Barca. The road to Cannae had begun. Based on the GBOH scenario "The Battle of Tader River" by Carlos Ibanez. 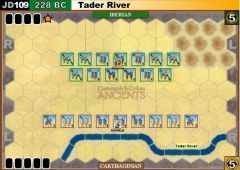 The river is fordable, but due to its fast flowing and swollen condition, any unit or leader entering a river hex must make a 1 dice casualty check and lose a block on an appropriate coloured or leader symbol. Iberian auxilia infantry units may not use missile fire. 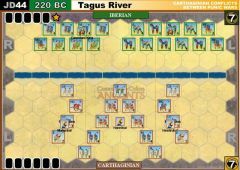 Ox Cart attack: Before the game begins the three Carthaginian medium infantry units must each make a 4 dice casualty check. Only blue triangle symbols are counted.